Headquartered at Mumbai, India, this is the holding company of the A.T.E. group. Headquartered at Mumbai, India, A.T.E. Enterprises handles industrial sales, distribution and service in the domains of textile engineering, cooling solutions, wastewater solutions, energy efficiency solutions, flow technology, and print and packaging solutions and Internet of Things for industries. Located at Pune, India, EcoAxis provides IoT (Internet of Things) solutions for a range of industries. Located at Bengaluru, India, HMX manufactures/provides comfort air conditioning products and solutions. Located at Ahmedabad, India, TeraSpin manufactures high precision spinning machinery components. Located at Mumbai, India, this company offers state-of-the-art comprehensive solutions for wastewater treatment, recycling, and sludge management, including ZLD. 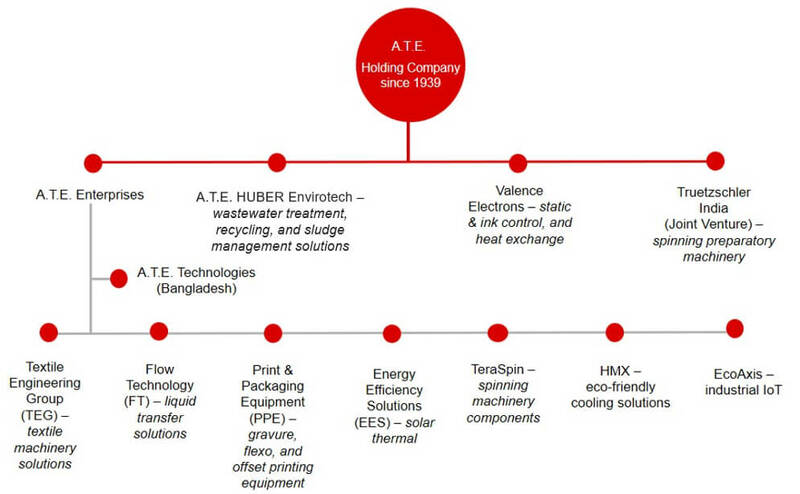 Located at Bengaluru, India, Valence provides a range of high quality electrostatic, ink handling, surface cleaning, and heat recovery solutions across several industry verticals.